Citibike Is Here! What Would Be The Best Princeton Bikeshare Locations? It has finally happened! Bikeshare has launched in New York, and as befits the Big Apple, it’s the biggest system in America, with 600 stations and plans to grow to 10,000 bikes! These chunky blue bikes could soon become as iconic a feature of New York as the traditional yellow cab! You can read a handy ‘frequently asked question’ page about the new system from New York City Department of Transport here. At the minute, only annual members can use the system, but daily members will be welcomed from this Sunday, June 2. The system works a little differently from ‘traditional’ bike rental, such as the bikes you can rent from Jay’s cycles here in Princeton. With New York’s Citibike program, users buy a membership either for a day, one week, or a year. The bikes are accessed at an automated station in the street, and must be returned to an empty slot at another station within 30 minutes or else additional charges apply. The idea is not to use the bikes for touring around, but instead for getting from one point to another. Of course, if you want to tour around, you simply have to return one bike before 45 minutes is up, and then check out another bike to continue your journey! Once you have a membership, you can theoretically ride around all day without paying any extra. Similar bikeshare programs have operated successfully for years in cities such as Montreal, Canada, Washington DC, and London, England. Next time you’re up in New York City, consider trying out the bikeshare! Daily passes will be available as of this coming Sunday, June 2, will cost $9.95 + tax, and can be purchased at any of the 600 stations (find a map of bikeshare stations here). If you are up in the city often, you may want to consider getting an annual membership, which costs $95 + tax and has certain perks such as easier access to the bikes with a dedicated keyfob, and a longer period of ‘free’ rental time per journey (45 minutes vs 30 minutes for weeekly and daily users). You can see a short video of somebody using an annual member’s keyfob to rent a Citibike here. Princeton would make a great location for bikeshare and West Windsor Bike and Pedestrian Alliance recently asked where the best locations in our area for bikeshare would be, if bikeshare ever launched here. We suggested Palmer Square, Princeton Shopping Center and the Dinky station as top potential locations in Princeton, among several others. If you have other ideas about where bikeshare stations could go around Princeton, either click through to WWBPA’s blog and leave your ideas there or comment here and we will pass it on! Incidentally, while the Citibike program is the largest in the USA, it is not the biggest in the world. That honor goes to ‘Hangzhou Public Bicycle‘ in China, which has over 2,400 bike stations and plans to grow to 175,000 bicycles! This entry was posted in Alternative Transportation, Biking. Bookmark the permalink. 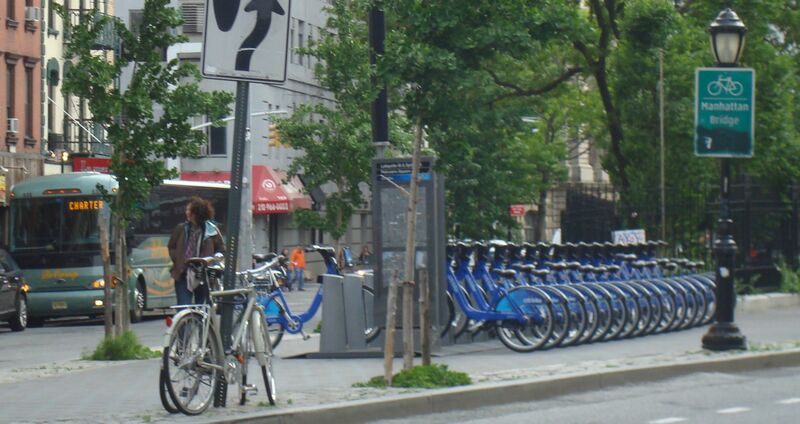 3 Responses to Citibike Is Here! What Would Be The Best Princeton Bikeshare Locations?